Easily handle PayPal™ purchases with this Stack, and display any Stacks on a successful transaction. Note: this is NOT a Buy Now button! Instead, this is what happens when your customer returns to your page AFTER making a purchase (see the How To below)! 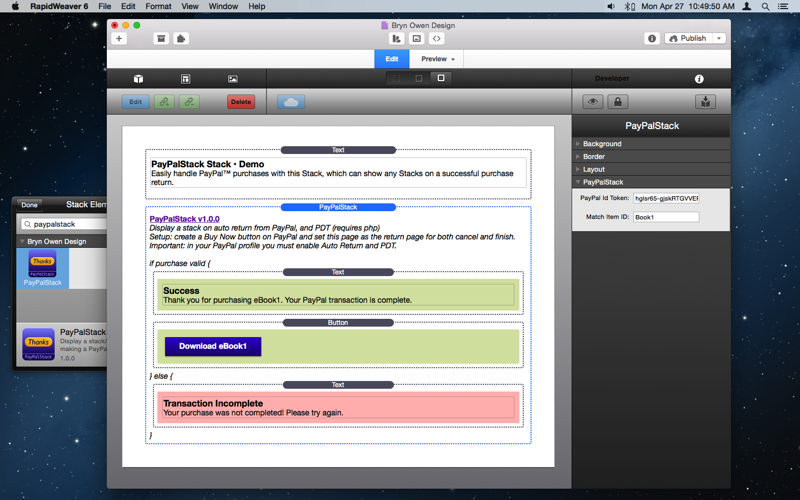 PayPalStack handles purchases from PayPal, when your customers are redirected back to your site after making a purchase. PayPal “PDT” must be enabled, and is used to lookup purchase details, and confirm the transaction is complete. For completed transactions, any one or more Stacks you desire are shown … this is great for providing customers with a link to their purchase download, a PDF, eBook, or MP3, etc. The Stack is able to determine when a purchase was canceled or failed, and lets you customize the Stacks to show in those cases as well. You’ll see it in action if you make a purchase on this site! See the complete How To section below for a complete walkthrough. PayPal transmits transaction details back to your site with PDT, where the PayPalStack receives them, and uses them to query PayPal back for more information such as the item_number, and confirm the transaction is complete. If it is complete, then your chosen Stacks are shown (another optional set is shown on failure). This Stack only requires basic information to do all of its work - your PayPal (seller) Id, and optionally an item_number and pulldown options you want to match if any. PayPal Id Token On your PayPal merchant account, Profile settings, Website Payment Preferences, enable Payment Data Transfer (PDT) and copy the Identity Token here. It is a long string of numbers, upper and lower case letters, and hyphens. This is case sensitive so you must enter this exactly as shown on your profile page. Match Item ID Optional Item ID to look for and match before considering this transaction. Using this option you can have several PayPal buttons return to the same page with PDT, each one with a different item_number code. Configure Item ID on the PayPal button during Step 1 of the Edit button process, then enter the string here (the comparison is not case sensitive though). Leave this blank to match any transaction. Whether this is used or not, the Stack sets the PHP variable confirmPurchase = true on success, otherwise it does not set/unset this variable. Match Option 1 Optional string value to look for and match, for your first dropdown or text option. If your button simply uses Item ID and nothing else, leave this blank, otherwise enter the dropdown string you wish to match. Note this not case sensitive (eg: if your dropdown contains the option Red Shirt, you can enter red shirt here). Match Option 2 Optional string value to look for and match, for your second dropdown or text option. If your button simply uses Item ID and nothing else, leave this blank, otherwise enter the dropdown string you wish to match. Note this not case sensitive (eg: if your dropdown contains the option Red Shirt, you can enter red shirt here). Match Option 3 Optional string value to look for and match, for your third dropdown or text option. If your button simply uses Item ID and nothing else, leave this blank, otherwise enter the dropdown string you wish to match. Note this not case sensitive (eg: if your dropdown contains the option Red Shirt, you can enter red shirt here). Check name/email/payment Disable this option to bypass checking of payment_gross or payer_email, and last_name. Normally these fields are checked to be sure they are not blank - a possible indicator of a falsified transaction, however in some cases you may need to skip this check. Default is enabled - check these fields. Add debug comments to html Enable this option to add extra comments into the HTML when transaction data is received, then use View Source on your page after PayPal returns to it from the purchase. Useful for debugging failed transactions, and for determining strings to use for Match Item ID and Match Option 1, 2, and 3. 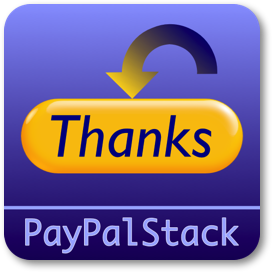 Setup PayPalStack as the return page from PayPal after a purchase. First, let’s assume you already have your eBooks prepared, and you created pages to market them. Each item you wish to sell needs to have a Buy Now button so that customers have a link to make their purchase. You must setup a PayPal account then use PayPal Tools for creating Buy Now buttons. Create each button with a unique one-word Item ID so that you can distinguish one purchase from another. You might call your items “Book1” and “Book2.” Each button should return to the Download page URL on completion. Creating a PayPal button is divided into three steps, and Step 1 is shown below. Make sure it is a Buy Now button, with a couple of words for the item name. The Item ID is required if you have more than one item for sale, otherwise PayPalStack can not tell the difference between items purchased. Enter a single-word Item ID. Choose a price then skip Step 2 and proceed to Step 3. 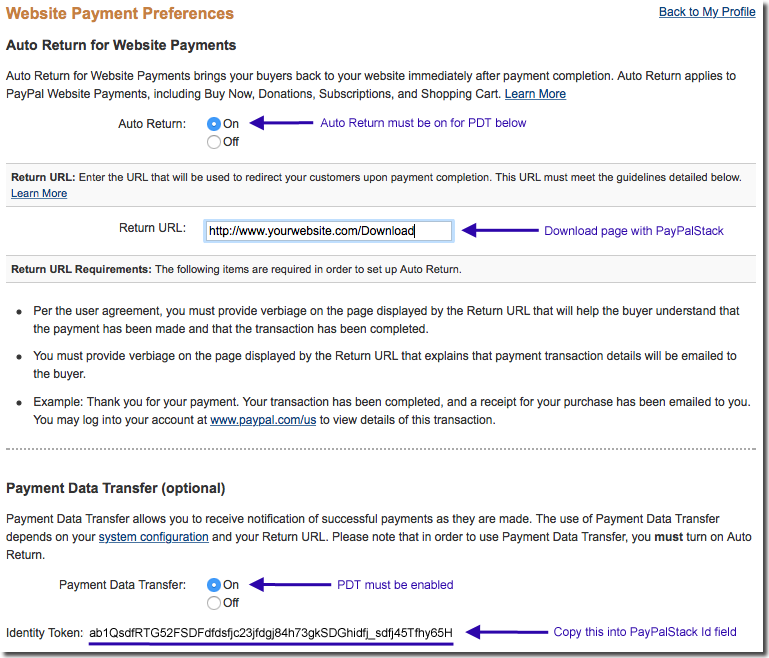 Create a PayPal button Step 3 sets the URL of the pages to return to if the purchase is canceled or is completed. Payment Data Transfer (PDT) is an account setting that sends transaction information back to your site that PayPalStack will use. 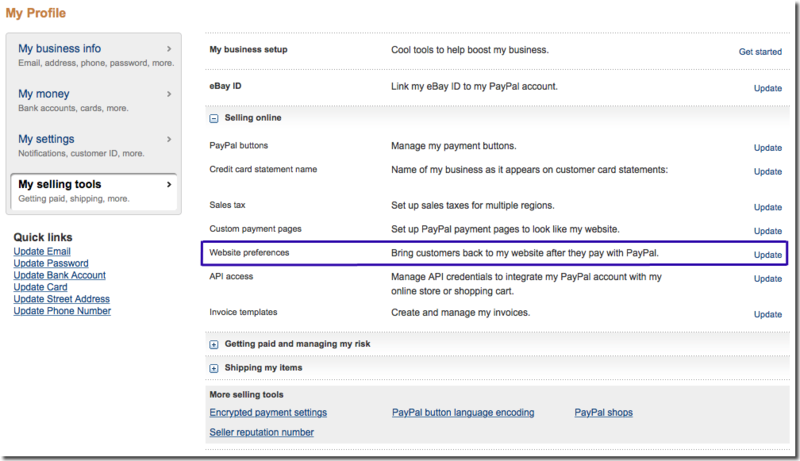 Auto Return from PayPal must be enabled to use this feature, so both need to be enabled in your account settings. 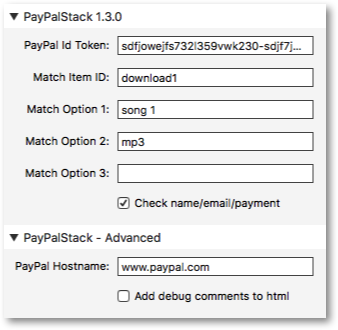 On your Download page create an instance of PayPalStack for each item that can be purchased. 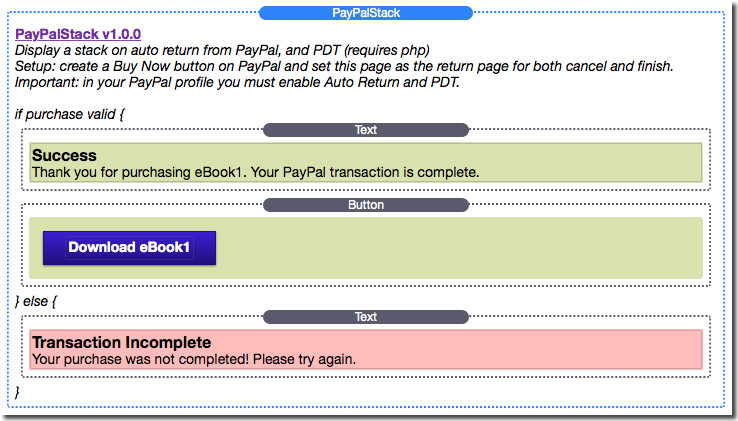 Two eBooks means two instances of PayPalStack on the Download page in this example. Add Stacks to provide information about a successful purchase (and a link to the download - I use a Button that links to my Resources file) and also add a Text Stack to provide information about a failed transaction.